This vintyage British film poster was used to promote the film Airplane in 1970 starring Burt Lancaster. 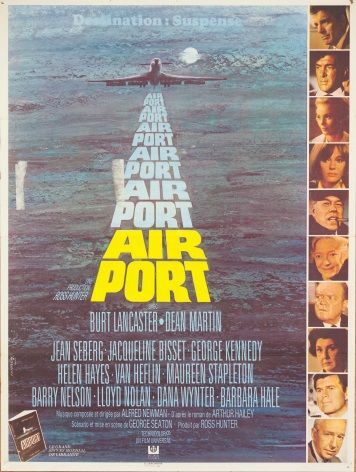 In this large-ensemble disaster movie, Mel Bakersfeld (Burt Lancaster), the general manager of a Chicago-area airport, must contend with a massive snowstorm and other issues, both work-related and personal, while the troubled D.O. Guerrero (Van Heflin) threatens to blow up an airliner. 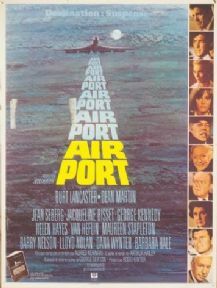 As pilot Vernon Demerest (Dean Martin) attempts to calm Guerrero down and dissuade him from setting off explosives on the plane, tensions increase in the air and on the ground, and danger is imminent.